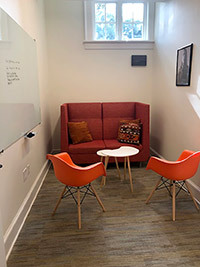 Drop-In Use Spaces | Maxine Platzer Lynn Women’s Center, U.Va. We have several spaces around the Center that are outfitted to serve students' needs, whether you're looking for a small study space or collaborative meeting area. These spaces are available on a first come, first served basis, unless they have been reserved by Women's Center staff, which will be noted by a schedule posted beside each door. Students may use these rooms during business hours from 9 a.m. to 5 p.m., Monday through Friday. And don't forget to visit our Room to Breathe, a cozy space where you can relax and take a break from meetings and studying.